The malignant cells of classical Hodgkin’s lymphoma (cHL), Hodgkin and Reed-Sternberg (HRS) cells, appear to be derived from germinal center (GC) B cells in most cases of the disease. Apart from recent findings of constitutive activation of some transcription factors and autocrine stimulation by cytokine receptors, the mechanisms of malignant transformation in cHL still remain poorly understood. We performed a large scale gene expression study using serial analysis of gene expression (SAGE), comparing the cHL cell line L1236 and human GC B cells. Semiquantitative RT-PCR was used to confirm results from the SAGE and to analyze gene expression in 3 additional cHL cell lines. To investigate expression of some genes in cHL cases, we applied RT-PCR on microdissected HRS cells. In total, 464 genes showed a change in expression level of 5-fold or higher. For 12 genes (out of 177) identified as upregulated in L1236 cells, RT-PCR confirmed the SAGE results and also showed elevated expression in 3 other cHL cell lines. For 3 of the upregulated genes, expression by HRS cells in the tissue also was confirmed. Several of the differentially expressed genes may play a role in the pathogenesis of cHL because they represent potential oncogenes, such as rhoC, L-myc, and PTP4A, or transcription factors, such as ATF-5, ATBF1, and p21SNFT. The genes that showed significantly deregulated expression in HRS cells should be helpful not only for the identification of genes involved in the pathogenesis of cHL but also for discovering potential prognostic markers or therapeutic targets. An erratum to this article is available online at https://doi.org/10.1007/BF03402132. Classical Hodgkin’s lymphoma (cHL), one of the most frequent lymphomas in the Western world, is characterized by the presence of rare Hodgkin and Reed-Sternberg (HRS) cells. HRS cells usually represent less than 1% of the cells in the tumor tissue. They show a peculiar phenotype that does not resemble any normal hematopoietic cell type because coexpression of markers known for distinct hematopoietic lineages is often observed (1, 2, 3, 4). Although HRS cells have lost expression of most typical B cell markers (1,5,7), molecular studies have shown that they derive from B cells in nearly all cases because they carry clonal immunoglobulin gene rearrangements (4). Several findings argue for a derivation of HRS cells from germinal center (GC) B cells: 1. In nearly all cases, HRS cells carry V region genes modified by somatic hypermutation, a process that takes place specifically in GC B cells (8,9). 2. In several composite Hodgkin and non-Hodgkin lymphomas, HRS cells of a cHL are related clonally to the tumor cells of a follicular lymphoma, the paradigm for a GC B cell malignancy (10, 11, 12). The presence of shared and distinct somatic V region gene mutations of HRS and follicular lymphoma cells strongly indicates that these lymphomas derive from 2 distinct daughter cells of a common precursor, a GC B cell. 3. All B cell-derived cHL cell lines have undergone class switch recombination, another process taking place in GC B cells (13). 4. In at least 25% of cHL cases, HRS cells carry destructive V gene mutations, leading to the loss of a functional B cell receptor (8). Since GC B cells acquiring such mutations are normally eliminated within the GC by apoptosis, HRS cells likely derive from transformed GC B cells that were rescued from programmed cell death and not from post-GC (that is, memory) B cells (4). In very rare cases (less than 5%), HRS cells originate from T cells (14,15). To date, there is no systematic large scale gene expression study available comparing HRS cells with normal GC B cells. In a recent study, a large number of EST clones derived from primary HRS cells and HL cell lines was sequenced (16). However, this analysis was hampered by inclusion of HRS cells of the lymphocyte-predominant subtype of HL, which show many phenotypic differences to HRS cells of cHL (4). For this reason, we decided to perform serial analysis of gene expression (SAGE) with HRS cells and human GC B cells. The SAGE method is used frequently for comparing gene expression in malignant cells to their nonmalignant counterparts (17,18) because, unlike array-based techniques, it can generate genome-wide expression profiles, including so far unknown transcripts. Because SAGE is technically not yet feasible with primary HRS cells, we investigated the cHL cell line L1236 with a proven origin from the original HRS cells of a cHL patient (19,20). Although there may be differences in gene expression between cHL cell lines and primary HRS cells, cHL cell lines mirror the gene expression of primary HRS cells in many aspects, not only regarding the expression of specific markers such as TARC, IL-13, and CCR7 (3,21,22) but also in terms of functional aspects such as constitutive NFκB activation (23). By comparing gene expression profiles of cHL cells and their nonmalignant precursor cells, we aimed to identify mechanisms of the pathogenesis of cHL and to identify genes that could represent prognostic markers or therapeutic targets. The cHL cell lines came from patients with cHL of either the nodular sclerosis (L428 and HDLM2) or mixed cellularity (KMH2 and L1236) subtype. HDLM2 comes from T cells; the other 3 HL cell lines come from B cells (19,20,24). 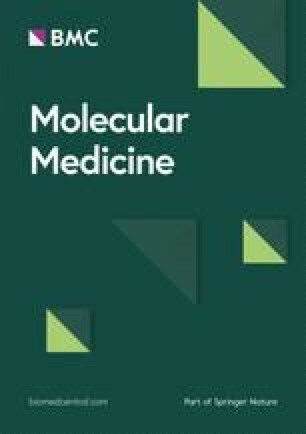 All cell lines were grown in RPMI-1640 medium with Glutamax-1 (Gibco, Karlsruhe, Germany) supplemented with 10% fetal calf serum and 100 U/mL penicillin/streptomycin at 37 °C in an atmosphere containing 5% CO2. Tonsils were obtained from patients after routine tonsillectomy and directly cooled at 4 °C. Mononucleated cells were purified by Ficoll density centrifugation (Amersham, Uppsala, Sweden). CD77+ GC B cells were stained consecutively with rat anti-CD77 (Coulter/Immunotech, Hamburg, Germany), mouse anti-rat IgM (Serotec/Biozol, Eching, Germany), and anti-mouse IgG1-microbeads (Miltenyi Biotec, Bergisch-Gladbach, Germany) and enriched by magnetic cell separation (Miltenyi Biotec). The purification was performed at 4 °C to minimize changes in gene expression. In total, 2.5 × 108 GC B cells were pooled from 8 donors to minimize effects caused by differences in individual gene expression (Figure 1). 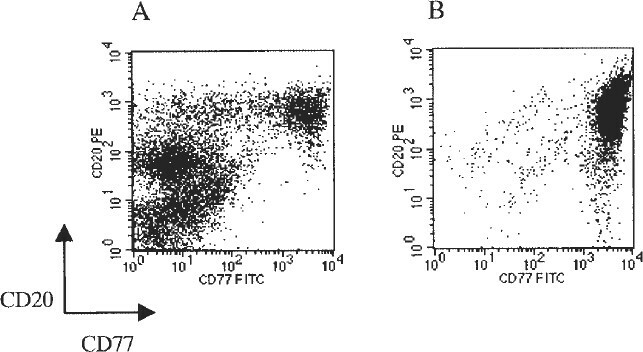 FACS analysis of human tonsillar mononucleated cells after Ficoll purification (A) and after MACS enrichment of CD77+ cells (B). The purity is higher than 95%. The figure shows the result for 1 of 8 tonsils used for the SAGE profile. SAGE generates a quantitative gene expression profile by high throughput sequencing (25). The method is based on the principle that a nucleotide sequence of 10 bases length (a gene tag) usually can be assigned to a unique transcript if its position in the mRNA molecule is known (downstream of the NlaIII restriction site nearest to the poly-A sequence). Poly-A+ RNA was selected using the Oligotex mRNA kit (Qiagen, Hilden, Germany) and 5 µg was used to synthesize cDNA (Gibco). SAGE was performed following the protocol version 1.0d (6) with slight modifications (7). SAGE profiles were generated by sequencing about 30000 tags of both cell populations. The data were analyzed using the SAGE Software 2000, Version 4.12. Adapter tags and duplicate dimers were excluded, and the tag numbers were normalized to 30000. The differential expression was quantified by generating the quotient of tag numbers of both profiles (for 0 set 1), which is given as the factor of down- or upregulation. All genes showing a decrease or increase of 5.0 or higher in expression were included in the analysis. The tag numbers and the quotient of fold change mentioned in text, tables, and figures are rounded up or down. Except for the cDNA samples for GC B cells and cell line L1236, which were synthesized as described above, total RNA of 3 other HL cell lines was isolated with Trizol (Gibco) and treated with DNase I (Promega, Mannheim, Germany). cDNA synthesis was performed using the SuperScript 1st-strand Synthesis System for RT-PCR (Invitrogen, Karlsruhe, Germany). RT-PCR was performed in duplicates (only 1 of each is shown) using aliquots containing the same amounts of cDNA of the cell line L1236 and GC B cells. cDNA samples were normalized to β-actin expression by real-time PCR because this procedure allows normalization with high accuracy. β-actin was chosen because both SAGE profiles show nearly same expression level of β-actin (Figure 2). For the comparison of the L1236 cell line with GC B cells, the cDNA samples were either pure or 3-, 9-, or 27-fold diluted. RT-PCR was performed in 20 µL to 50 of 200 µM each of dNTP, 1 × Sigma PCR buffer, 3 mM MgCl2, 2 U Sigma Taq DNA polymerase (Sigma, Deisenhofen, Germany), and 187 nM of each primer. The amplification program consisted of 60 s at 95 °C, followed by 30 cycles of 20 s at 95 °C, 20 s at 60 °C, 20 s at 72 °C, and finally 5 min at 72 °C. The oligonucleotide sequences were as follows: ATBF1 forward: 5′-GTC TGA CAC GGA TCT CAG C-3′, ATBF1 reverse: 5′-GTC CGT TCC TAC ACT GGT C-3′, FK506 binding protein 4 forward: 5′-CTG GTT GGA TGG TGG CTT TAG-3′, FK506 binding protein 4 reverse: 5′-TTC ATG TGC AAT GGA GGA GG-3′, Hnmp-1 forward: 5′-TGC TGT CTC TCC TTC ATC CTG T-3′, Hnmp-1 reverse: 5′-ATC AAG GCG CCA GTA AAC ACC-3′, interleukin-1 receptor associated kinase-1 (IRAK-1) forward: 5′-GGG AAG GGA AAC ATT TTC AGG-3′, IRAK-1 reverse: 5′-GGC TAC TTT TGG ACA CGC AAG-3′, Jun-B forward: 5′-GGC TCG GTT TCA GGA GTT TGT-3′, Jun-B reverse: 5′-GCC CGG ATG TGC ACT AAA AT-3′, L-myc forward: 5′-TCC ACA CCC GTG AGA AAT CCT-3′, L-myc reverse: 5′-TTC CAT ACC CCA TTC CCC A-3′, P21SNFT forward: 5′-AAG GCT GAC AAG CTC CAT GAG-3′, P21SNFT reverse: 5′-CCG CAG CAT GGT GTT TTC TT-3′, Prame forward: 5′-TGT TTC ATG CCT AAC TAG CTG-3′, Prame reverse: 5′-AAC TGT GGC TGC TTT GTT G-3′, PTP4A forward: 5′-GAA ATA CCG GCC CAA ACA GAG-3′, PTP4A reverse: 5′-TCC TGA CCT ACA TGA CGA CCA G-3′, px19 homologue forward: 5′-GAA TTT GGT CTT GCC CGG T-3′, px19 homologue reverse: 5′-CGT CTC CTT TGC CTT CTC CTT-3′, rhoC forward: 5′-CAG TGC CTT TGG CTA CCT TGA-3′, rhoC reverse: 5′-TTG TTC TTG CGG ACC TGG A-3′. Semiquantitative RT-PCR analysis for 12 genes in L1236 and GC B cells (CB, centroblasts). cDNA of L1236 and GC B cells was normalized to β-actin by real-time PCR. Equal amounts of cDNA were introduced in RT-PCR analysis using 4 different cDNA dilutions for L1236 (left panel) and GC B cells (right panel). RT-PCR was performed until a faint band was detectable in the lowest dilution of the L1236 cDNA. By comparing the intensity of the bands of L1236 and GC B cells on an agarose gel, the difference of expression for a given gene was estimated. Normal RT-PCR analysis of β-actin is given in the lowest panel and shows the same amount of PCR product for both cell populations. In total, 12 genes found to be upregulated in the SAGE analysis were analyzed. For some cDNAs primerdimers are visible and represent the lower bands. Tag numbers are normalized to 30000 tags. The lymph nodes of 4 cHL patients were analyzed. Patients 1 to 4 were a 29-y-old male with nodular sclerosis HL at relapse, a 40-y-old female with 1st presentation of nodular sclerosis HL, a 31-y-old female with 1st presentation of nodular sclerosis HL, and a 33-y-old female with 1st presentation of nodular sclerosis HL, respectively. Frozen tissue sections, 5µm-thick, were mounted on membrane-covered slides and incubated with hematoxylin containing RNase inhibitor (200 U/mL; Roche, Mannheim, Germany) for 4 min. Sections were washed in DEPC-treated water for 2 min, incubated in 2% eosin for 15 s, washed again, and dried at 37 °C for 3 h. Single HRS cells were isolated with a UV-Laser beam (P.A.L.M. Microlaser Technologies, Bernried, Germany), catapulted into 20 µL of Purescript® lysis buffer (Biozym Group, Hessisch Oldendorf, Germany), and pooled into groups of 50 cells. From the same sections, groups of 5 non-HRS cells were isolated also and pooled into groups of 50 cells. GC B cells were isolated from sections of 2 tonsils and pooled into groups of 50 cells. The Purescript® RNA Isolation Kit (Biozym Group) was applied in a modified manner using glycogen as a carrier and reducing all reagents to one-tenth of the amounts given in the standard protocol. In the analysis of ATBF1 expression a DNase I digestion (Stratagene, Amsterdam, The Netherlands) was performed because of the existence of processed pseudogenes for ATBF1 in the genome. Isolated RNA and 0.6 µM of a gene-specific reverse primer (rhoC reversesc 5′-CGC TTG TTC TTG CGG ACC TGG A-3′, ATBF1 reversesc 5′-GGT GTC CGT TCC TCA ACT GGT C-3′, p21SNFT reverse2sc 5′-TCC CGA TCT CTC TCC GCA GCA TGG-3′) were heat denatured at 70 °C for 10 min. T4 gene 32 protein (Ambion, Huntingdon, UK) was added at a concentration of 1.5 per sample during the initial denaturation. Reverse transcription was performed using the OneStep RT-PCR kit components (Qiagen), including 10 U RNase inhibitor (Roche). The reverse transcription reaction mixture was preheated to 50 °C for 2 min after which 2 µL of Qiagen OneStep RT-PCR enzyme mix was added. cDNA synthesis was performed at 50 °C for 30 min. For several samples of tonsillar GC B cells, the presence of intact RNA was verified by RT-PCR analysis for CD52 transcripts. CD52 is expressed by all lymphocytes. For reverse transcription, the primer CD52 reverse (5′-CTG GTG ATG TCT GGC ATC AAC C-3′) was used under the conditions described above. For RT-PCR analysis, 2 rounds of PCR were performed, using 1 µL of the 1st round reaction in the 2nd round. All primer pairs except for ATBF1 were intron-spanning. In all reactions, dNTP concentrations were 200 µM, primer concentrations were 0.125 µM, and the HotStarTaq DNA polymerase system (Qiagen) was used in a reaction volume of 50 µL. The 1st round of PCR was performed applying the reverse primers used for cDNA synthesis and the corresponding forward primers (rhoC for-ward1sc 5′-ACC CGG ACA CTG ATG TCA TCC TC-3′, ATBF1 forward1sc 5′-CCT CCA GGA AGT CTT GGC CGC-3′, p21SNFT forwardsc 5′-AGC TCC CGG CAT GTC GCA AGG-3′). For amplification of a fragment of the rhoC and the ATBF1 genes, samples were adjusted to 3 mM MgCl2. Cycling conditions were 15 min at 95 °C, 60 s at 61 °C (ATBF1) or 65 °C (rhoC), 60 s at 72 °C, 24 cycles (ATBF1) or 29 cycles (rhoC) of 30 s at 95 °C, 30 s at 61 °C (ATBF1) or 65 °C (rhoC), and 45 s at 72 °C followed by a final 5 min incubation at 72 °C. In the 2nd round of amplification, an internal forward primer (rhoC forward2sc 5′-CAG TGC CTT TGG CTA CCT TGA-3′; ATBF1 forward2sc 5′-GGA GTC TGA CAC GGA TCT CAG C-3′) was used together with the reverse primer of the 1st round to amplify a 115 bp (ATBF1) or a 105 bp (rhoC) fragment of the genes. The reaction and cycling conditions were the same as in the 1st round, with the exceptions that either 27 or 30 cycles were performed (rhoC), 2 mM MgCl2 was used, and the annealing temperature was 65 °C (ATBF1). For amplification of a fragment of the p21SNFT gene, samples were adjusted to 2 mM MgCl2. Cycling conditions were 15 min at 95 °C, 60 s at 65 °C, 60 s at 72 °C, and 29 cycles of 30 s at 95 °C, 30 s at 65 °C, and 45 s at 72 °C, followed by a final 5 min incubation at 72 °C. In the 2nd round of amplification, an internal reverse primer (p21SNFT reverse1sc 5′-TTC GGA CCT TCC TGT CAT CAT CC-3′) was used together with the forward primer of the 1st round to amplify a 131-bp fragment of the gene. The reaction and cycling conditions were the same as in the 1st round, with the exception that 1.5 mM MgCl2 was used. Some PCR products were sequenced, confirming that the correct products were amplified. Samples of HRS cells and control cells were analyzed in parallel, together with controls containing only Purescript® lysis buffer. Some non-HRS cell samples were analyzed in parallel with KMH2 positive controls. PCR for transcripts of the CD52 gene from GC B cell samples was performed in 1 round of PCR (40 cycles), using the cDNA synthesis primer and a forward primer binding to a sequence in exon 1 of the gene (CD52Ex1, 5′-GCT GCT ACC AAG ACA GCC ACG-3′). PCR conditions were as described above, using 2 mM MgCl2 and 65 °C annealing temperature. The resulting intronspanning PCR product has a length of 327 bp. A PCR product of expected length was obtained from 5 of 6 samples tested. We generated SAGE profiles from the cHL cell line L1236 and human GC B cells. For the isolation of GC B cells we decided to use CD77+ GC cells because gene expression analysis based on oligonucleotide arrays (26) showed surprisingly few differences between gene expression patterns of tonsillar centrocytes (defined as CD10+ CD77−) and tonsillar centroblasts (defined as CD77+) (27). The reason for this may be that CD77 does not completely distinguish between these 2 cell populations, although CD77 is commonly used as a centroblast marker. The purity of CD77+ cells used for this study was higher than 95% (see Figure 1). After exclusion of duplicate dimers and adapter tags, a total of 29514 tags for the GC B cell profile and 30034 tags for the cHL cell line profile were analyzed and represented 11056 and 10493 distinct tags, respectively. The abundance class distribution is as expected from previous SAGE studies. Most transcripts (83%) are represented with 1 or 2 tags, whereas 8% of transcripts are present with 5 tags or more. In total, 464 distinct transcripts were shown to be differentially expressed by a factor of 5 or higher. The factor of 5 was chosen as an arbitrary cut-off point in this analysis, due to the high number of differentially expressed genes identified. It should be pointed out, however, that this led to the exclusion of a significant number of genes that may be important in cHL pathogenesis, as they are expressed in L1236 at high levels and are expressed more strongly in L1236 than in GC B cells. (A list of these genes is available from the authors upon request.) Moreover, if larger SAGE profiles had been generated, additional differentially expressed genes that were below our cut-off point of 5-fold difference would have been identified. When compared with GC B cells, the cell line L1236 showed 177 transcripts with higher expression and 287 with lower expression. (The complete list of differentially expressed tags [5-fold or higher] is available online at https://doi.org/www.bloodjournal.org/cgi/ content/full/101/4/1505/DC1.) The 20 transcripts with the highest decrease or increase in expression are shown in Tables 1 and 2. Several genes previously reported to be specifically expressed or upregulated in HRS cells were found to be upregulated in this study also, namely the actin-bundling protein Fascin (18 tags in L1236:0 tags in GC B cells), the chemokine TARC (14:0), TNF (8:1), CD44 (6:0), neuron-specific enolase 2 (8:1), and CCR7 (18:0) whereas a few other genes, such as IL-13 and CD30, were not identified (2,3,19,21,22,28, 29, 30). The latter could be due to a relatively low level of gene expression or the presence of gene polymorphisms in the tag sequences of L1236, which is known to be positive for both CD30 and IL-13 (19,22). n indicates the number of times the tag was identified per 30000 tags. The fold difference was calculated as described in Materials and Methods. Many of the genes down-regulated in L1236, as opposed to GC B cells, demonstrate the lost B lineage-identity of HRS cells, as they represent genes normally expressed B cell-, lymphocyte-, or hematopoietic-specifically and are presented in detail elsewhere (7). CB, centroblasts. n indicates the number of times the tag was identified per 30000 tags. The fold difference was calculated as described in Material and Methods. CB, centroblasts. Analyzing the downregulated genes, a dramatic loss of B lineage-specific gene expression became obvious, affecting nearly all B-cell specific genes. Only some genes involved in MHC class II-restricted antigen presentation are still expressed or even show an elevated expression, for example, CD40, B7.1, B7.2, and some MHC class II alleles. A detailed analysis and discussion regarding this phenotypic loss of B lineage identity is presented elsewhere (7). In addition to the B lineage-specific genes, the most highly decreased transcripts include the regulator of G-protein signaling 13, a negative regulator of G-protein signaling (31) that is 14-fold downregulated in L1236. Notably, 2 other transcripts that function in negative regulation of G-protein signaling also are downregulated in HRS cells: regulator of G-protein signaling 5 (11-fold) (32) as well as G-protein pathway suppressor 1 (6-fold) (33). Another, 2 transcripts with an inhibiting function for rho protein activity show reduced expression in cell line L1236, namely rho GDP dissociation inhibitor (GDI)α and rho (GDI)β (both 6-fold) (34,35). Our further studies concentrated on transcripts showing an increased expression in the cHL cell line L1236. We excluded from the analysis all tags lacking an entry in Unigene, matching not further specified cDNAs or protein Genbank entries, and genes that function in more general metabolic processes. From the remaining genes with known function and potential functional interest, we selected 46 genes that we considered to be of particular interest and divided them into functional classes, such as transcription factors or kinases and phosphatases (Table 3). Several transcripts known to be involved in or associated with malignant transformation are upregulated or specifically expressed in the L1236 cell line. This includes potential oncogenes, such as PTP4A (36), rhoC (37), or L-myc (38), cathepsins known to be important in tumor progression (39), and genes involved in cell adhesion, such as the laminin receptor (40) or CD44 (41). In addition to molecules playing a role in signaling cascades, such as Dvl-1 (42) or Nm23-H1 (43), several transcription factors show elevated expression (see Table 3). aShown are only selected genes (46 of 92 genes) listed in functional classes with gene name and short functional description; some genes are listed in several classes. bThese genes were represented by tags that matched more than 1 entry in Unigene. For some of these genes (rhoC, L-myc), the tag assignment was verified by the RT-PCR results (see Figure 2). To investigate the reliability of SAGE results, selected upregulated genes were analyzed by semiquantitative RT-PCR for their expression levels. We chose 12 of the 46 genes that we found to be of potential functional relevance for cHL pathogenesis (see Table 3) for this analysis: Prame, a common tumor antigen (44); PTP4A, a putatively oncogenic phosphatase (36); p21SNFT, a Jun-dimerization protein which inhibits AP-1-mediated transactivation (45); rhoC, a member of the Ras homology family, which plays a role in transformation and tumor progression (37); ATF-5, a transcription factor of the ATF/CREB protein family (46); ATBF1, a transcription factor containing zinc finger and homeobox domains (47); L-myc, a transcription factor of the myc protein family (38); IRAK-1, which plays a role in IL-1/IL-18 and Toll-like receptor signaling (48); Hnmp-1, a transmembrane protein with potential receptor function (49); px19 homologue, a transcription factor with unknown function (50); FK506 binding protein 4, an immunophilin which binds to the imunosup-pressant FK506 and is ubiquitously expressed (51), and Jun-B, a transcription factor of the basic leucine zipper protein family (52). Equal amounts of cDNA were introduced in RT-PCR analysis. Four cDNA dilutions were used to facilitate a semiquantitative estimation of the differences in expression levels between L1236 cells and GC B cells (Figure 2). For most of the investigated transcripts, the difference in expression between the cell line L1236 and GC B cells was verified (see Figure 2). There are some differences regarding the factor of differential expression. Hnmp-1, ATF-5, and px19. These differences can be easily explained by the fact that all 3 transcripts have low expression (at least in GC B cells) and therefore were represented in the SAGE profiles with low tag numbers. In such cases, levels of transcription predicted by SAGE are obviously not as reliable as they are for more highly expressed genes. Meanwhile we also have used, in collaboration with R Dalla-Favera’s group, oligonucleotide microarrays to monitor gene expression in HL cell lines (53). While a global comparison of these and the SAGE data is difficult because appropriate software is not available, we have found that of the 12 genes shown by SAGE and RT-PCR to be upregulated in the L1236 cell line, 10 also have shown higher expression in L1236 than in human centroblasts in the microarray analysis. The remaining 2 genes (px19-homologue and P21SNFT) were not present on the chip. Are the genes upregulated in the L1236 cell line generally upregulated in HRS cells? To investigate this issue, we performed RT-PCR for the 12 genes described above, comparing semiquantitatively the expression levels in L1236 and 3 other cHL cell lines (L428, KMH2, and HDLM2). PCR results show that all transcripts analyzed can be detected in all 4 HL cell lines, albeit in different amounts (Figure 3). For most transcripts, expression levels in L428, KMH2, and HDLM2 cell lines are as high as or higher than in L1236 (see Figure 3). Therefore, the genes identified in this study likely represent transcripts that are generally upregulated in HL cell lines compared with human GC B cells. Semiquantitative RT-PCR analysis for 12 genes in 4 HL cell lines (L428, KMH2, HDLM2, and L1236). The cDNA of the 4 HL cell lines was normalized to β-actin by real-time PCR. RT-PCR analysis of β-actin is given in the lowest panel and shows the same amount of PCR product for all cell populations. A limited cycle number was performed to retain the differences in band intensities in the gel analysis. For each gene, the PCR results are shown for the lowest cycle number at which a PCR product was obtained for all 4 cell lines. These cycle numbers were between 28 and 35 cycles. For some cDNAs primerdimers are visible and represent the lower bands. For 2 transcripts, PTP4A and L-myc, L1236 is the cell line which shows the highest expression of the 4 HL cell lines. Therefore, for these genes it cannot clearly be stated that the expression level in the 3 other HL cell lines is much higher than that in GC B cell because GC B cells were not included in this analysis. Because RT-PCR on primary microdissected HRS cells is laborintensive, only 3 of the 12 genes shown to be expressed in all 4 cHL cell lines (rhoC, ATBF1, and p21SNFT) were exemplarily analyzed for expression in primary HRS cells. Nearly 2000 single microdissected HRS cells from 4 cases of cHL were pooled into groups of 50 cells. Three such samples per cHL case were analyzed by a seminested RT-PCR approach in parallel with groups of 50 non-HRS cells (mainly lymphocytes) from the same sections and groups of 50 centroblasts from 2 tonsils (Table 4). For each of the 3 genes, all 3 or at least 2 samples of HRS cells from the 4 cases analyzed were positive in the PCR, whereas nearly all samples from non-HRS cells and all GC B cells were negative (see Table 4). Thus, we confirmed expression of 3 genes in primary HRS cells. aGroups of 50 HRS cells and 50 non-HRS cells (small cells isolated from the same tissue sections as the HRS cells) were analyzed. Pools of 50 GC B cells isolated from sections of 2 tonsils were analyzed as additional controls. Intact RNA in the tonsillar samples was confirmed by successful amplification of a fragment of the CD52 RNA from several GC B-cell samples (not shown). Buffer controls represent reaction tubes with buffer but without cells. Groups of 10 FACS-sorted KMH2 cells served as positive controls for cDNA synthesis and RT-PCR. bThe few positive non-HRS cell samples may be due to cellular contamination of the samples by fragments from HRS cells or expression of the respective genes by some cells among the non-HRS cells. The main advantage of the SAGE technique is the quantitative nature of the results. To confirm this, we performed semiquantitative RT-PCR for 12 transcripts identified as upregulated in L1236. The PCR results verified the upregulation shown by SAGE for all genes tested. To exclude the possibility that only L1236-specific rather than HL-specific genes were identified, these 12 genes were analyzed for expression in 3 other HL cell lines. 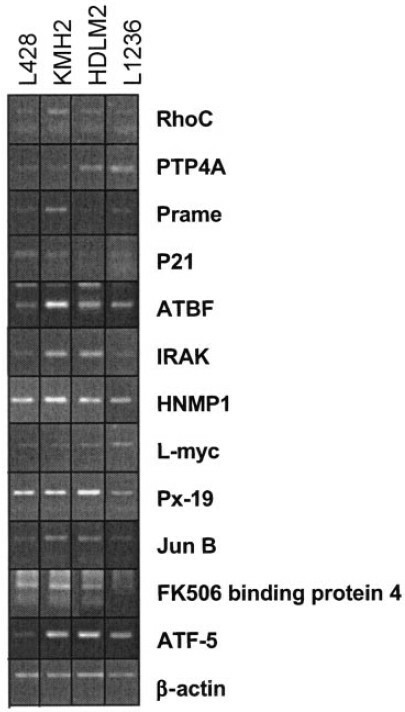 By semiquantitative RT-PCR, transcripts of all 12 genes were detected in these 3 HL cell lines. Therefore, upregulation of these genes seems to be a common feature of HL cell lines. Unfortunately, no commercially available antibodies exist for many of these genes and analysis with anti-rhoC and anti-L-myc antibodies failed to give evaluable results on immunoblot analysis. However, for 3 genes (rhoC, ATBF1, and p21SNFT), expression by primary HRS cells was confirmed by RT-PCR on microdissected HRS cells from 4 cases of cHL (see Table 4). This indicates that at least a significant fraction of the genes identified here are also expressed in primary HRS cells. While the present analysis is based on the comparison of cHL cells to their normal counterpart, it also would be interesting to analyze SAGE profiles of non-Hodgkin lymphomas for the expression of the genes identified here as being differentially expressed between HL and GC B cells. Such profiles have not yet been published, but SAGE allows one to perform comparisons with other profiles once they become available. In addition to the downregulation of most B lineage genes (see Results), the strong downregulation of 3 inhibitors of G-protein signaling is of interest, namely regulator of G-protein signaling 5 (32) and 13 (31) and G-protein pathway suppressor 1 (33), although another inhibitor, regulator of G-protein signaling 16 (55), shows nearly 5-fold upregulation. Decreased expression of these inhibitors could influence G-protein signaling in HRS cells. Two transcripts coding for rho GDIα and GDIβ (34,35), which are negative regulators of Rho protein activity, also showed decreased expression in L1236. This finding is of special interest because rho genes represent oncogenes and rhoC is shown here to be overexpressed in HRS cells (see below). Whether the lack of these inhibitory proteins results in an enhanced activity of the corresponding pathways in HRS cells remains to be determined. In total, 178 transcripts showed at least 5-fold upregulation in cell line L1236. Table 3 lists 46 of what we considered to be the most interesting genes. Twelve of these genes, all of which were shown to be expressed in all cHL cell lines analyzed, and 3 which were expressed in primary HRS cells also, are discussed in more detail in the following paragraph. Several of the upregulated genes represent (putative) oncogenes: rhoC is a member of the Ras homologous (Rho) subfamily of proteins, which functions in actin-remodeling processes. Rho proteins are involved in cell cycle progression, differentiation processes, and transformation (56). In addition, rhoC was shown to play an important role in tumor progression as overexpression enhances metastasis (37). The expression of rhoC in HRS cells in cHL tissues (see Table 4) renders it an interesting candidate for further investigations. Protein phosphatase IVA (PTP4A or Prl-3) itself has not yet been shown to act as an oncogene, but Prl-1 and Prl-2, close homologues of PTP4A, can transform mouse fibroblasts and hamster pancreatic epithelial cells (57,58). Moreover, high expression levels of PTP4A correlate with metastasis in colorectal cancer (36). L-myc is a well-known oncogene of the myc gene family (38). 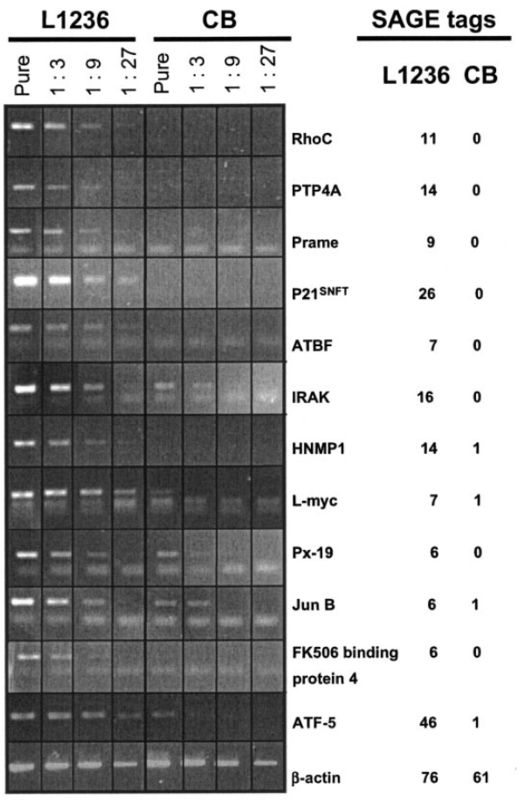 In addition to L-myc, 4 other transcription factors showed an elevated or specific expression in cHL cell lines: ATF-5, ATBF1, p21SNFT, and Jun-B. ATF-5, a member of the ATF/CREB protein family, is supposed to regulate cAMP-induced expression and was shown to bind cAMP-responsive elements as a homodimer (46). ATBF1, originally identified as a repressor of the α-fetoprotein gene (47), also acts as a repressor of c-myb transcriptional activity by protein-protein interaction (59). Additionally, ATBF1 plays a role in myogenic and neurogenic differentiation (60,61). Another transcription factor strongly upregulated in L1236 is the Jun dimerization protein p21SNFT, which was shown to repress AP-1 activity, probably by forming heterodimers with c-Jun (45).The role of p21SNFT in HRS cells is not clear however, because at least some AP-1 target genes are expressed and inhibition of AP-1 leads to decreased proliferation in these cells (62). Jun-B, slightly upregulated in L1236 compared with GC B cells, is also a member of the basic leucine zipper protein family but in contrast to c-jun no significant transforming capacity has been shown so far (52). IRAK-1 is a key mediator of the IL-1 receptor superfamily, which includes IL-1, IL-18, and the Toll-like receptors. IL-1 signaling plays a critical role in the immune and inflammatory responses and leads to activation of NFκB and AP-1 (48). It may be interesting to investigate whether the upregulation of IRAK-1 contributes to the constitutive activation of these transcription factors in HL (23,62). Prame, which is specifically expressed in all 4 cHL cell lines, is a common tumor antigen that was originally identified as an antigen on melanoma cells recognized by cytotoxic T cells (44). Since Prame is not expressed in normal tissue, it would be a valuable candidate for immunotherapy of cHL. Taken together, we identified several genes that show strong upregulation in L1236 cells as opposed to their presumed nonmalignant counterpart, GC B cells. Most importantly, for 12 of these genes, it was shown that they are consistently upregulated in cHL cell lines. For 3 genes, expression in primary HRS cells was demonstrated. Of particular interest is the upregulation of several transcription factors and oncogenes that may contribute to HRS cell transformation. It would be interesting to inactivate these factors in HL cell lines or ectopically express them in B cells, in order to assess their functional importance and potential suitability as therapeutic targets. Additionally, some of these factors may become novel prognostic markers. This work was supported through the Deutsche Forschungsgemeinschaft by SFB502 and a Heisenberg award to RK. We are grateful to Yvonne Blum, Michaela Fahrig, Christine Gerhardt, and Tanja Schaffer for excellent technical assistance, to Berit Jungnickel for stimulating discussions, and to Carel van Noesel for critically reading this manuscript.